It is sometimes said that people want the kingdom of God without God. Such an aspiration, however, is never to be fulfilled. Good government can exist when the relationship between the citizens and the government is like that exemplified by Lord Ramacandra and His citizens. Lord Ramacandra ruled His kingdom exactly as a father takes care of his children, and the citizens, being obliged to the good government of Lord Ramacandra, accepted the Lord as their father. Thus the relationship between the citizens and the government should be exactly like that between father and son. When the sons in a family are well trained, they are obedient to the father and mother, and when the father is well qualified, he takes good care of the children. As indicated by the words sva-dharma-nirata varnasrama-gunan-vitah, the people were good citizens because they accepted the institution of varna and asrama, which arranges society in the varna divisions of brahmana, ksatriya, vaisya and sudra and the asrama divisions of brahmacarya, grhastha, vanaprastha and sannyasa. This is actual human civilization. People must be trained according to the different varnasrama occupational duties. As confirmed in the Bhagavad-gita (4.13), catur-varnyam maya srstam guna-karma-vibhagasah: the four varnas must be established according to varying qualities and work. The first principle for good government is that it must institute this varnasrama system. The purpose of varnasrama is to enable people to become God conscious. Varnasramacaravata purusena parah puman visnur aradhyate [Cc. Madhya 8.58]. The entire varnasrama scheme is intended to enable people to become Vaisnavas. Visnur asya devata. When people worship Lord Visnu as the Supreme Lord, they become Vaisnavas. Thus people should be trained to become Vaisnavas through the system of varna and asrama, as they were during the reign of Lord Ramacandra, when everyone was fully trained to follow the varnasrama principles. Simply enforcing laws and ordinances cannot make the citizens obedient and lawful. That is impossible. Throughout the entire world there are so many states, legislative assemblies and parliaments, but still the citizens are rogues and thieves. Good citizenship, therefore, cannot be enforced; the citizens must be trained. As there are schools and colleges to train students to become chemical engineers, lawyers or specialists in many other departments of knowledge, there must be schools and colleges to train students to become brahmanas, ksatriyas, vaisyas, sudras, brahmacaris, grhasthas, vanaprasthas and sannyasis. This will provide the preliminary condition for good citizenship (varnasrama-gunan-vitah). Generally speaking, if the king or president is a rajarsi (of a saintly character), the relationship between the citizens and the chief executive will be clear, and there will be no possibility of disruption in the state, because the number of thieves and rogues will decrease. In Kali-yuga, however, because the varnasrama system is neglected, people are generally thieves and rogues. In the system of democracy, such thieves and rogues naturally collect money from other thieves and rogues, and thus there is chaos in every government, and no one is happy. But here the example of good government is to be found in the reign of Lord Ramacandra. If people follow this example, there will be good government all over the world. Millions of years ago in the age called Treta-yuga, the Supreme Personality of Godhead Lord Sri Krishna descended as a king: Lord Rama, or Ramachandra. His adventures were written down by the poet Valmiki in the 24,000-verse Sanskrit scripture Ramayana, the world’s oldest book. The purpose of Lord Rama’s advent is to attract us conditioned souls to the timeless, transcendental path of Bhakti-yoga, devotional service, and to establish the principles of religion, morality and righteousness. By reading the Lord’s pastimes in the Srimad-Bhagavatam or Ramayana, and by hearing of His exceptional prowess, even the unsophisticated soul becomes drawn to the blissful security of genuine spiritual life. Since time immemorial each of us embodied souls has been revolving through the cycle of rebirth—samsara. To deliver His servants trapped in the net of maya(illusion), God comes Himself or sends His avatar for our salvation from the delusion of material ignorance. Attraction to the lotus feet of the Lord, acceptance of His divine shelter, and the joyful singing of His name open the door for going back home, back to Godhead. Ramachandra appeared in the Sun Dynasty as the son of King Dasharatha, in the line of King Ikshvaku, the first ruler of Earth. Lord Rama was the darling of His father and mother, Queen Kaushalya, as well as the hero of all Ayodhya, the capital of what was then a single world kingdom. 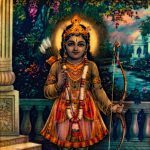 Rama had all the admirable qualities of leadership, even from earliest youth. He possessed all physical strength, beauty, religious wisdom, fame for prowess with weapons, royal wealth, and complete renunciation. Inseparable from Rama was Lakshmana, His younger brother. Together, the two brothers appeared on Earth to vanquish the almost invincible atheist king Ravana and his numberless host of Rakshasa (man-eating) warriors. Ramachandra is described as being of greenish hue, His bodily luster like fresh green grass. Lakshmana is golden-hued. No one was equal to Rama. While Rama was still a boy of 16, the yogi Vishwamitra approached King Dasharatha and asked that Rama be allowed to travel on a military campaign against two Rakshasas who were attacking the hermitages of saintly persons, interrupting the performance of sacrifice. After some hesitance by Dasharatha, who was loathe to have his son part for a dangerous mission, Ramachandra went forth. If we take military history as an evolution of progressively more deadly weapons, we may slight the figure of Rama, possessing no more than a bow and arrow. But the enemies of Rama were allowed no such miscalculation as to His ability to destroy. He stood before them like a hill of nuclear missiles. He discharged His feathered arrows in sheets which blotted out the blue of the sky and which entered the hearts of the enemy in unlimited numbers at incredible velocity. His bow, a gift from the demigod Indra, was a supreme Army and Air Force in itself. His arsenal included many varieties of deadly arrows, charmed by the science of mantras, or sound vibration. Once released, those arrows would follow their target, no matter where the adversary fled for shelter. In the final battle against Ravana, Lord Rama resorted to a nuclear weapon, the Brahmastra fire weapon, whose released heat is said to frighten the denizens of the uppermost planets of the material universe. And this Brahmastra, too, was a winged arrow affixed to a bowstring. “Among the weapon wielders, I am Rama,” Lord Krishna says in the Gita. God is the greatest warrior, and He possesses the means to release the ultimate weapon. On this boyhood military campaign against these “rovers of the night,” Rama discharged two wind weapons, killing one Rakshasa and landing the other a few thousand miles away in the ocean. Vishwamitra, being pleased with young Rama and Lakshmana, narrated many wonderful things to them, about the appearance of the Lord as the dwarf Vamana, about the origin of the sacred river Ganges—and about a worshipable bow kept by King Janaka, the father of Sita. This Janaka is mentioned in the Bhagavad-gita as having attained perfection by carrying out his occupational duties as a kshatriyaking. Once, for his part in ameliorating the anger of Lord Shiva, Janaka was presented with a most formidable bow. The bow was so mighty that no one could even bend it in order to string it. Janaka made offerings of flowers and prayers before the bow given him by Lord Shiva, acknowledging that the person who could string the sacred bow must be of extraordinary power. In view of which, King Janaka offered the hand of his daughter Sita to the man who would come and bend the bow. Sita, of course, had many suitors, and all failed to win her. Of all chaste and beautiful young women, she was the topmost jewel and was very dear to Janaka. Vishwamitra brought Rama and Lakshmana to Janaka’s palace just to show them the bow given by Shiva. At once, Rama easily bent the bow until it cracked in two pieces, making a thundering explosion which rendered all present unconscious, except for Vishwamitra, Rama and Lakshmana. At that time the gods showered flowers from the sky upon Ramachandra, and there was cheering in the heavens. King Janaka then agreed, with great pleasure, that his daughter should be married to the mighty Ramachandra. 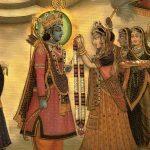 Sita, the wife of Rama, is not considered an ordinary being. It is understood that, as Lord Ramachandra was Vishnu, the Supreme Lord Himself, so Sita was actually Lakshmi, the Goddess of Fortune, who serves eternally at the side of Vishnu in the spiritual sky. Being the daughter of the royal saint Janaka, she is also sometimes called Janaki. It is stated in Ramayana that Sita came to Earth for the destruction of Ravana, who was a vilifier of married women. As Ramachandra was the greatest warrior and expounder of religion and morality, so Sita was the greatest beauty among women, and the most chaste. Valmiki compares the sight of Rama and Sita together to the moon and the brightest star. The night before, Janaki and Ramachandra were observing a fast, and were given mantras to recite. They worshiped Narayana, and lay down on a bed of grass within Vishnu’s shrine. The Ramayana goes on to relate fateful events. One of King Dasharatha’s wives, Queen Kaikeyi, had brought up an orphan girl named Manthara, who served Kaikeyi as a maidservant. It was she who sowed the evil seed of the great personal ordeals related in the Ramayana. Amidst universal joy, Manthara had heard the news of Rama’s coronation with a feeling of rage. 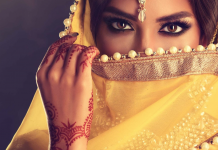 With malicious intent she entered the room of Queen Kaikeyi and proposed to her that the coronation of Ramachandra was a calamity to the queen. Kaikeyi was the mother of Dasharatha’s second oldest son, noble Bharata. Manthara cunningly outlined how Dasharatha had recently sent Bharata away on a visit to his uncle, in order to install Ramachandra. And, after the installation, Ramachandra would surely see that Bharata was killed. With crooked logic, Manthara predicted all the grief ahead for Kaikeyi, and in this way implanted evil wrath into the queen’s heart. Queen Kaikeyi was now convinced that Ramachandra must be eliminated. She was very dear to Dasharatha, and she was able to strike tellingly by binding him to a promise. Once Dasharatha had fallen badly wounded on a battlefield, in a clash between Indra and some Asuras (demons), and Queen Kaikeyi had nursed him as he lay unconscious. At that time he had promised her two boons, but she had said she would ask for them at a later time. Let Bharata be installed as king. Dasharatha fell unconscious at her words. He soon regained his senses, understood what she was saying, and again fainted away. We may think, why didn’t Dasharatha simply say, “No! Never! I will not banish Rama. Rama is dearer to me than truth!” But he did not. He had made a promise, and as a kshatriya (warrior) he had to stand by it. His religion was truth. Because he had promised Kaikeyi a boon at a time when she had saved his life, therefore he was obliged to grant her the promise, whatever it might be, in this case a fate worse than death. Dasharatha was ruined, and the Kingdom of Ayodhya with him. Dasharatha lamented bitterly, and prepared himself to be condemned by his peers and by the future. Still, he was bound to the truth of his promise. Ramachandra was called to court by Dasharatha. Rama was about 26 years old, and it was His coronation day. He rode in His chariot to answer His father’s call. It is said that Ramachandra came out from His palace surrounded with an effulgence of glory, just as the moon emerges from behind the dark blue clouds. Lakshmana stood by Him with a yak-tail fan. Elephants and horses followed His chariot; and music, shouts and cheers were continually heard. As He passed the windows of beautiful women, they rained flowers on His head. Some of them praised Kaushalya, the mother of Ramachandra, and others said that Sita was the gem of all women, and must have practiced great penances in former births or she would not have had such a husband as this king-to-be. But on entering His father’s presence, Rama found the old King looking miserable and distressed, seated on a sofa with His Queen Kaikeyi. She personally delivered the cruel message to Ramachandra. Dasharatha fainted away in grief at hearing again the wish of Kaikeyi, but he could not deny it. Ramachandra proceeded to inform all those gaily preparing for His coronation that He was at once leaving for a mendicant’s life in the forest. His natural cheerfulness did not leave Him, but He was troubled to have to tell His mother, and He thought both parents might die at His separation from them. The fateful news soon spread. It spread to the women in Rama’s palace, and they began to cry bitterly. The queens and other royal ladies wailed, for He who used to serve them and who looked on them as His mothers, and who never grew angry with them but had sweet words for all, that Rama was going to the forest! When He approached His mother Kaushalya, she was still informed only of the coronation, and she fell at His feet and offered Him a seat and some refreshment. Kaushalya fainted on the ground like a tree felled by an axe. Valmiki describes how, with difficulty, she told Rama that He must fight to win the crown. 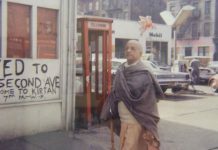 But Ramachandra told His mother that it was beyond His power to disobey His father’s orders. He could not follow any desire which went beyond righteousness. Lakshmana was not consoled. He was brooding and overwhelmed with grief at this turn of events. Lakshmana argued that Ramachandra must not submit; he suspected, in fact, that the whole story of promised boons was just a plea by the king in order to install Bharata, and thus satisfy the lust of his queen Kaikeyi. Lakshmana was prepared to hack to pieces with his sword the king and his whole army. He was ready to bring the whole world under the sway of Ramachandra. Rama replied that he thought the best course for Himself was to obey His father’s orders. Rama’s mother gradually, with great sorrow, offered her blessings and prayed that she would someday see Him coming back. Ramachandra then took leave of His mother and went to Janaki’s quarters. She also knew nothing of Ramachandra’s exile. She was in a state of joyfulness over His installation as king. She was worshiping the deities when He entered with His head hanging down low. On telling Sita of His exile, Ramachandra said that she must stay behind and live under the rule of Bharata. Janaki, who was always sweet in speech, replied to Him with an offended air. How could He say such infamous, unworthy things, especially as He was a hero versed in Vedic science? But Ramachandra, thinking of the factual hardships of forest life, told her about the reality of the situation. Prowling animals, crocodiles in muddy rivers, sometimes no drinking water, no bed, hunger appeased by fruits fallen on the ground, matted locks, bark for clothes, observance of the rules of asceticism, this was the business of forest life. Ramachandra said it was too dangerous, but Sita entreated Him that, as a devoted wife, she was happy in His happiness, and sorry only in His sorrow. With Rama, she assured Him, she would find the hardships heavenly. Ramachandra finally relented and admitted that He was by no means unable to protect her in the forest. And, formerly, many royal saints had repaired to the forest with their wives. So He would follow their example. He advised her to at once give away her beautiful clothes and valuables, and to be ready to leave. Lakshmana, who had been there while Ramachandra spoke with Sita, caught hold of his brother’s feet, as it was unbearable for him to be separated from Rama. Rama tried to dissuade him from joining them. He asked him to stay in the kingdom and keep an eye on the court. But nothing could turn Lakshmana. He replied that Bharata would maintain the kingdom, but he must be given leave to join Ramachandra. He would go before Sita and Ramachandra as their guide, and would procure their foods; and they could enjoy while he would do everything else required, whether Rama was asleep or awake. Rama was pleased, and ordered Lakshmana to prepare for departure at once. Unfortunately, the whole kingdom could not join Ramachandra in exile, and the people were sorely distressed. Indeed, they proposed to join Him by the thousands, but Kaikeyi would not allow it. If everyone went with Him, it would be no exile at all. No, Ramachandra must go with only Sita and Lakshmana. But the people lamented that the city would become deserted without Him, all religious institutions would be destroyed and dirt and filth would cover the yards, and rats would roam free. Ramachandra, hearing them carry on, was not moved. Shortly after Ramachandra’s departure, his father died of grief. He could not live with Rama in exile, and with his last breath he cried the names of Rama, Lakshmana and Sita. Young Bharata was at once called back from his uncle’s house by special messengers, who told him no more than to come at once. Bharata arrived before his mother, Queen Kaikeyi, and learned first that his father was dead, and then that his brother was exiled on the wish of his mother. Bharata was shaken with remorse and called Kaikeyi a murderess. To Bharata there was no question of assuming the throne without Ramachandra and Lakshmana. After performing the funeral rites for his father, he set out without delay, with an army behind him, to bring Rama back and himself take the place of the exiled in the forest. Only in that way could he hope to remove the stain of his mother’s action. Forest life for a royal prince was supposed to be an abominable insult, but Ramachandra managed to cheer up Sita by pointing out the beauty of the natural setting. The brothers embraced. Bharata told of Dasharatha’s death and pleaded for Ramachandra to return and take the kingdom. Ramachandra replied to His younger brother that none of us have an independent existence just to do as we please. We are subject to death, all of us. 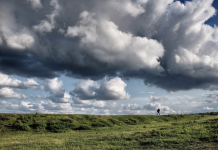 Rama told him to note how people are pleased to see the seasons change, though they do not realize it means their life duration is shortening. And on any walk a person takes, death is with him, and walks with him and rests with him. So in all circumstances, intelligent people subdue grief. He told Bharata to return and take charge, because that was the wish of their father. Ramachandra said, “Let me pursue My duties here.” Bharat pleaded that he was only a boy, and Rama must rule over him. But Rama was firm in keeping His father’s pledge. He cited a Vedic proverb, “He who saves his father from the hell named put, and he who saves his father from all sorts of difficulties, is putra, or the true son.” Bharata relented, but took back with him Ramachandra’s sandals, promising to dedicate the kingdom to the sandals of Rama and to wait in ascetic observance for the expiration of the 14-year exile. The first clash with the demon King Ravana took place through his sister, Shurpanakha. She was a hideous monster who wandered into the cottage of Rama and was struck with lust on seeing the Lord. She delivered some low insults to Sita, and for that Lakshmana cut off her ears and nose. Running back to the camp of Ravana, she howled for revenge, and the death-struggle thus commenced. Ravana had almost everything. Through long performance of austere penances he had gained great power. He had received specific boons from Lord Brahma, the topmost demigod, so that he would never be vanquished by any race of demigods, or any power or personality except man. But, of course, no mere man could stand against his onslaught. For the sake of war-mongering he had conquered the demigods Kuvera and Indra. He reigned in a vast island kingdom called Lanka (present-day Ceylon) and possessed all material opulence. He and his “rovers of the night” roamed about killing and eating the flesh of solitary hermits engaged in spiritual practices in the forest. Ravana made a career of violating beautiful women wherever he found them, and had a large harem of hundreds who had surrendered to his material effulgence of wealth and strength. Ravana believed himself unvanquishable. He did not care for God. He challenged even the existence of God. He had a plan where he wanted to deport men to the heavenly planets by means of a staircase structure reaching to Indra’s paradise, so that people could go there without qualifying themselves by performing pious works. He challenged anything and everything good and listened to no cautious counsel about the bad reaction which follows sinful activities. Valmiki says that Ravana’s mentality was such that he was living for death. In challenging Rama by the abduction of His wife Sita, Ravana surely chose death, and raced headlong towards his inevitable meeting with it. There was no fear of sin in Ravana. Until such time as he was cut down by a superior power, he would violate the authority of the Lord as far as possible. For all his highly developed intelligence, Ravana was ignorant of the soul. Thinking his one life to be all there is, and death the end of everything, he justified all sorts of heinous acts. This is the ignorance by which the conditioned living entity is covered over, and by which he cannot realize his original situation of sat-chit-ananda, transcendental eternal bliss, and full knowledge in the loving service of the Lord. Learned sages have concluded that as soon as anyone, from the tiny ant up to the conqueror Ravana, takes the attitude that he is the lord and the center, then material nature awards him this bodily covering, by which he can go on acting in illusion, ignorant of his real dependence on the Soul of souls, God. Under the illusion that he is independent, he then engages in a futher struggle to conquer material mature. Ravana’s case is extraordinary because, in defiance of the Supreme Personality of Godhead, he actually did conquer a significant part of the universe. But, as we shall see, his victory, like that of all the worldly conquerors of history, was fleeting, and his every step was actually a step on the path towards his ultimate destruction. From Ravana’s kingdom, 14,000 Rakshasa warriors poured forth to slay Rama and Lakshmana. En route, Ravana’s troops experienced a downpour of evil omens. Blood showered upon them with dreadful noise. The horses pulling their chariots suddenly tumbled. Vultures attacked their royal flags. Birds, beasts and jackals howled. Rama was informed of their coming. While doom was presaged to the Rakshasas by dark clouds and raining blood, the shafts of Ramachandra were flaming in war-delight, and His gold-plated bow throbbed with ruthless energy. The 14,000 warriors were demolished by Ramachandra alone and on foot. His arrows, resembling fire with smoke, covered the whole sky, and He discharged them and fired more with a speed that the enemy could not follow. One man-eater survived, and ran back to Ravana with the news that Ramachandra had devoured them with shafts like a five-mouthed serpent. He said that, wherever they had fled, they had found Ramachandra stationed before them. Ravana was outraged and reminded the lone survivor that Vishnu Himself couldn’t be safe by doing injury to Ravana. But the survivor who had been through the hell of slaughter pleaded that his Lord Ravana just listen to him with attention regarding Ramachandra’s valor as he had experienced it. He humbly submitted to his chief that Ramachandra could bring down the stars and planets and raise the submerged Earth by His arrows, and could destroy all creatures and create them anew. Ramachandra was simply unslayable. The survivor also offered to Ravana that he had seen the beautiful wife of Rama, called Sita. He said that no woman could be equal to her in beauty. She was in the bloom of youth, and most graceful. Her beauty struck one with such deep wonder, the RRakshasa concluded, that if Ravana could somehow enchant Rama into the forest and take her away, it would be the one way to vanquish Him, for He surely could not survive separation from His wife. To implement the abduction of Sita, Ravana called on his warlord, Maricha. This Maricha was the same Rakshasa who had been carried 1,000 miles through the air and thrown into the ocean by the wind arrow of the 16-year-old Rama on His first military expedition. Ravana asked Maricha to take the form of a golden deer, to frisk in front of Sita. When Sita should wish to have the deer for her own, Rama and Lakshmana could be induced to follow it and, at that time, Sita might be carried off. Maricha was filled with alarm on hearing such talk from Ravana. He reported to his chief that the proposal was impossible. For one thing, “as Indra is the king of the gods, so Ramachandra is the King of all.” Nobody should dare to take Sita away, as she was protected by chastity and devotion. Maricha knew that Ramachandra was death-like, and he advised Ravana to desist from his thoughts of crossing the Lord. The King of the Rakshasas, irritated that his subordinate had even attempted to dissuade him, told Maricha that he must perform this service or be killed. Maricha, in the form of a wonderful deer with silver spots and the sheen of jewels, appeared before Sita in the forest. His hoofs were made of blue stones, and he had a little tail that shone like the rainbow. He walked this way and that, browsing on creepers and sometimes galloping. In so many ways, he drew the mind of Sita, who asked Ramachandra to catch him for her. Lord Ramachandra is, of course, none other than the Supreme Personality of Godhead Himself. He knows past, present and future. 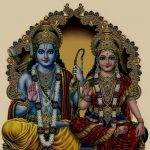 For the sake of establishing the principles of morality, He, accompanied by the Goddess of Fortune, played the parts of Rama and Sita and let these pastimes unfold. Waiting with Lakshmana in their cottage, Sita heard the cries and believed it was Rama, and that He was in some danger. She told Lakshmana to go at once and help Him. Lakshmana dismissed the idea that Ramachandra could be in danger. Besides, he knew his duty was to remain and protect Sita. But Sita, in great anxiety over Rama, began to speak harsh words. She accused Lakshmana of not going to help Rama out of lust for her. Lakshmana could not bear to hear such unfair words and left to seek out Ramachandra. This was the moment Ravana had been waiting for. He found Sita alone and carried her off by force. On a chariot pulled by donkeys, Ravana of ten heads and twenty arms flew through the sky with his arm around Sita. Sita was protected from gross sexual violation by her power of chastity. Also, Ravana had at one time in his career received a curse from the yogi father of a girl he had violated: if Ravana ever attempted to again enjoy a woman by physical force, his head would split into pieces. By this act of abduction Ravana completely sealed his doom beyond a doubt. Not only would he die for capturing another’s wife, but he would not even be able to enjoy her in the meantime, not for a moment. Unable to forcibly have his lust satisfied, Ravana gave Sita a tour of opulent Lanka. He showed her the swans and ponds, and his harem. He showed her how thousands of mighty Rakshasas awaited his word. And he described Ramachandra as a weak outcaste who would never be able to come to Lanka. He asked Sita to rule over Lanka, and he would become her slave. Though she was weighted down with sorrow and deeply absorbed in anxious thoughts, Sita seared Ravana by telling him that for this reckless outrage he would be destroyed by Rama and Lakshmana. Ravana could only threaten Sita that if after twelve months she did not favorably turn to him, he would cut her into pieces and have his cooks serve her to him for a feast. Playing the role of a human distraught upon losing His beloved wife, Ramachandra was plunged into grief. He appeared crazed, and His understanding clouded. He was going through the forest asking the flowers and trees if they had seen His love. He feared she had been eaten by the Rakshasas. He and Lakshmana searched everywhere. Rama questioned the sun: “Where has My darling gone?”—He asked the wind if she were dead or alive or stolen, or had he seen her on any path? Lakshmana attempted to draw off Ramachandra’s despair by sensible words, but he was paid no attention. Finally the brothers found signs of Sita, pieces of clothing torn while resisting Ravana, and ornaments which had fallen from her as she rose up in his chariot. They also found the bloodied, dying body of Jatayu, the ancient king of birds, who had made a valiant attempt to stop Ravana’s flight. Frothing in his last blood, Jatayu informed Ramachandra that it was Ravana, the King of the Rakshasas, who had taken Sita. The brothers got further information that they could obtain the help needed to find Ravana’s kingdom by making alliance with Sugriva, the King of the Vanaras, a monkey race who lived in the southern region of rivers and lakes. Rama and Lakshmana sought out Sugriva, who, as it turns out, shared a similar misfortune. Sugriva’s wife had been abucted by his enemy, Vali. A mutual allicance was formed. Rama and Lakshmana helped Sugriva defeat Vali, and Sugriva and his monkey army set out to help Rama and Lakshmana defeat Ravana. Sugriva mobilized his forces and sent them out to all quarters in search of Lanka, Ravana’s kingdom, where Sita was imprisoned. But after months of futile searching, the armies began to lose hope. It was Sugriva’s chief minister, Hanuman, who received information that the kingdom of Lanka was an island far across the Indian ocean. Hanuman resolved to travel through the air in search of Janaki. As the son of the wind god, Vayu, he had special powers and could fly in the sky. He could also make himself very small, or very large, as the situation required. With these words he sprang up with ease. Like Garuda, the eagle carrier of Vishnu, Hanuman flew over the water, raising great waves by his speed and exposing the aquatics below, who fled in fear. At times Rakshasas rose from the sea for his destruction, but he was not deterred in his mission. Sri Valmiki says that when Hanuman landed in Lanka and went over the city wall, it appeared as if he had planted his left foot on the crown of Ravana. Hanuman was delighted to observe the city of Lanka. For protection, he reduced himself to the size of a cat, and then proceeded to walk into the city, taking careful note of how everything was situated. He walked along the roof of a seven-storied building and saw at a short distance the palace of Ravana, surrounded by a glittering wall. The palace was guarded by armed Rakshasas, whom Valmiki describes as “never shrinking from anything on account of moral principles.” Treading past noisy drinking parties and quiet gatherings, past big mansions with spacious halls, Hanuman gained access at last to the inner chamber of Ravana. The time was past midnight, and the monkey warrior observed a virtual sea of beautiful women, sleeping under the influence of drink. Hanuman was looking for the one woman described to him as Sita, and there was no question of his being moved by a harem full of disheveled beauties. Hanuman’s agitation was, rather, that time was passing, and he had not yet found Sita. In the center of the chamber, on a crystal dais, he saw an elaborately decorated bedstead. And upon the bed lay Lord Ravana himself. Ravana was spread out in intoxication, “like an elephant in sleep.” Lying like that, his body smeared with red sandalwood pulp, and wearing bright cloth, he presented the perfect spectacle of a sensualist in royal power. But where was Sita? Hanuman paced up and down the city wall. He began to think that his leap across the ocean had been in vain. Finally the noble monkey came upon a dense grove of Ashoka trees. There, seated under a tree, wracked with grief, but still radiantly beautiful, with tears flowing down her face, was Sita. She was seated on the ground like an ascetic, wane, and sad for the absence of Ramachandra. She was undergoing a continual, harrowing nightmare of separation from Rama. Hideous Rakshasa monsters of misshapen form danced in a ring around her, telling her rumors of Rama’s weakness and death. Hanuman’s first step was to communicate with Sita and assure her. He was certain this was her because of the information he had received about her appearance. He had to approach her, gain her confidence that he was not another Rakshasa, and convey to her that Rama and the Vanaras would soon be on their way to her rescue, so that she must not give up her life. Hanuman began to speak to her from his place, concealed within the branches of the tree. Janaki was delighted to hear him. She had some doubt, but Hanuman was very sweet of speech, assuming a large form, reddish and clothed in white. And he recited to her the history of King Dasharatha and Ramachandra and Lakshmana and Sita. Listening to this being who so cheerfully pronounced the name of Rama, Sita began to shake off her ascetic firmness. She was becoming convinced that she was beholding Ramachandra’s messenger, and that was as good as seeing Rama Himself! She thought for a time that Hanuman might be another mirage, but the monkey told her things too treasured to be Rakshasa deceit. 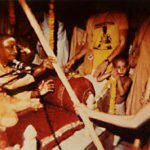 Ramachandra had given to him the utmost confidence. With folded palms, Hanuman approached Sita and gave her a ring from Rama. In blissful exchange, Sita offered that Hanuman should ask Rama, “Do you remember the time we were wandering in the Dandaka Forest and a crow was disturbing me, and You shot him with an arrow?” Sita then listened to the rest of Hanuman’s story. When, however, he related Ramachandra’s grief at her separation, she became very distraught. Assuring her that she would soon be re-united with Lord Rama, Hanuman finally left. In parting, Sita told him that she could only live one more month like this, and then she would give up her life. Before heading back with his message, Hanuman decided to gauge the enemy’s power. In a miraculous display of prowess, Hanuman broke down all of the trees in the Ashoka forest except the one under which Sita was seated. He then sat upon the main gate of Lanka and, uprooting a bolt, shouted out that he was Hanuman, a Vanara, and the servant of Ramachandra! Frightened Rakshasas rushed out to see him expand himself to gigantic size, ranging the sky, determined to fight. Hanuman single-handedly destroyed thousands of Rakshasa warriors and top military personalities, and set fire to every house in the city, declaring again and again: “None of you will survive when you make an enemy of Ramachandra!” Then he flew back across the ocean, and landed with a great noise upon a mountain peak. Without delay, the Vanaras under Sugriva mobilized, and built a miraculous bridge of stones across the ocean. 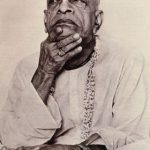 In this connection, A.C. Bhaktivedanta Swami has written that, as the Supreme Lord floats countless planets in space as though they were no more than little cotton swabs, certainly He can float one bridge of stones upon an ocean. Numbering in the millions, with all military equipage, the army marched across the ocean and into Lanka under the very nose of the Lord of the Rakshasas. Even up to the last moment Ravana was oblivious to the warning that he didn’t have a chance in his plan to keep Sita and oppose the wish of Ramachandra. In hand-to-hand combat, great heroes from both sides fought to the death day after day, with thousands of fatalities among the troops. Finally, one by one, great Rakshasa chieftains, such as Kumbhakarna, Narantaka and Indrajit, the son of Ravana, fell before the unlimited powers of heroes like Hanuman, Lakshmana, Sugriva and Ramachandra. Finally, Ramachandra slew Ravana with a Brahmastra released from His bow. Valmiki tells of the origin of this weapon: It was handed down by Lord Brahma, and passed from sage to sage. The Brahmastra was smeared with fat and blood, and smoked like doomsday fire. It was hard and deep sounding, and when shot by Ramachandra it cleft Ravana’s heart in two, depriving him of life. 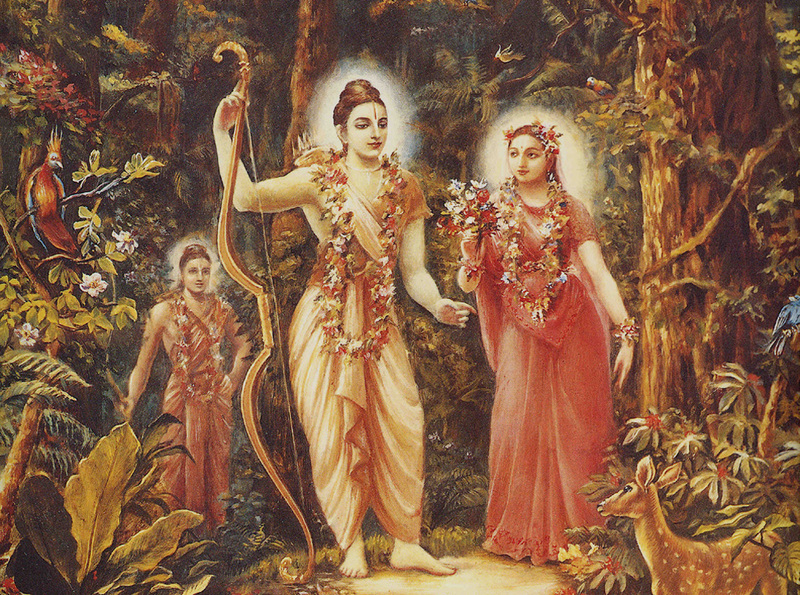 Immediately after the victory, Sita was brought before Rama for a joyful reunion. They returned to Ayodhya on a flower airplane and were inaugurated as King and Queen of the world. They ruled justly and piously over all the lands, to the delight of the citizens. It is said that during the reign of Lord Ramachandra, the Supreme Personality of Godhead, all necessities of life were available in abundance. All bodily and mental suffering, disease, old age, bereavement, lamentation, distress, fear and fatigue were completely absent. There was even no death for those who did not want it. Fearing such rumours, Rama reluctantly gave up Sita’s company and placed her in the care of the forest ashram of Valmiki. There, Sita gave birth to twin sons, Lava and Kusha. Unable to tolerate living in separation from Lord Rama, Sita entrusted the twins to Valmiki, meditated on the lotus feet of Lord Ramachandra and entered back into the earth from whom she had originally appeared. After hearing about Sita entering into the earth, Rama was aggrieved. Although He is the Supreme Personality of Godhead, upon remembering the exalted qualities of Sita, He could not check His emotions in transcendental love. He observed complete celibacy and performed an uninterrupted fire sacrifice for many years. After completing the sacrifice, Lord Ramachandra placed His lotus feet in the hearts of those who always think of Him, and returned to His own abode in the spiritual sky. To this day, millions of years after the advent of Sita-Rama, Their followers number in the hundreds of millions. The supreme royal couple is even worshiped outside India. In Thailand, for example, a quarter-mile stretch of the halls of the royal palace is artistically painted with scenes from the Ramayana. On the island of Bali in Indonesia, and also in Cambodia and Nepal, thousands more Rama temples can be found. In every corner of India, from tiny village shrines to fabulous temple palaces like Hare Krishna Land at Juhu Beach, Mumbai, the transcendental form of Lord Rama is worshiped, His all-liberating name sung by His devotees.